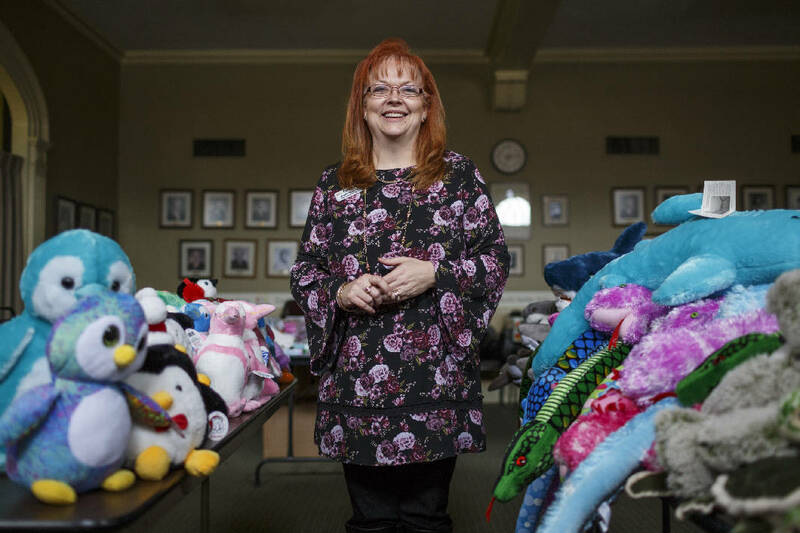 Partnership for Children, Families, and Adults COO Regina McDevitt poses for a portrait with plush toys from the Aquarium's Gifts for Guppies program, one of the services the organization offers for clients around the holidays, in their offices on Friday, Dec. 8, 2017, in Chattanooga, Tenn.
Photo by Doug Strickland /Times Free Press. Regina Johnson McDevitt has worked at the Partnership for Families, Children and Adults for more than 20 years, and in that time she has seen the Times Free Press Neediest Cases fund help clients with a wide range of needs. From helping a woman flee her abuser to helping another woman afford dentures, the local fund that residents can donate to over the holiday season provides a much-needed safety net for those struggling throughout the year. "It's not just to pay for some light bill but for safety, too," said McDevitt, the chief operating officer for the Partnership. With many nonprofit organizations experiencing state and federal cuts to funding, the local fund asks community members to donate and support their less fortunate neighbors. Chattanooga Times Publisher Adolph Ochs started the fund in 1914 as a way for community members to help others in their city with a one-time financial donation. The fund is managed by the United Way of Greater Chattanooga. Olivet Baptist Church also uses Neediest Cases funds to help its members and neighbors. This past year, the fund helped several people, including one woman who needed money to fix her water heater. Joe Jackson, church administrator, said many of the people they help would not receive anything if it were not for Neediest Cases. "Many times they have exhausted most of their resources and gone to several agencies already," Jackson said. "When they come to us it's kind of a last stop." McDevitt said the Partnership uses the fund regularly during the year. The organization has been in the area since 1877 and has more than 20 programs — from foster care and adoption to elder support and deaf services — that help families and individuals in the area. "I feel like Neediest Cases does help families stay in their homes," McDevitt said. "There are no other resources that can impact an individual or family in the way that it does." Contact Allison Shirk at allisonshirk92@gmail.com.